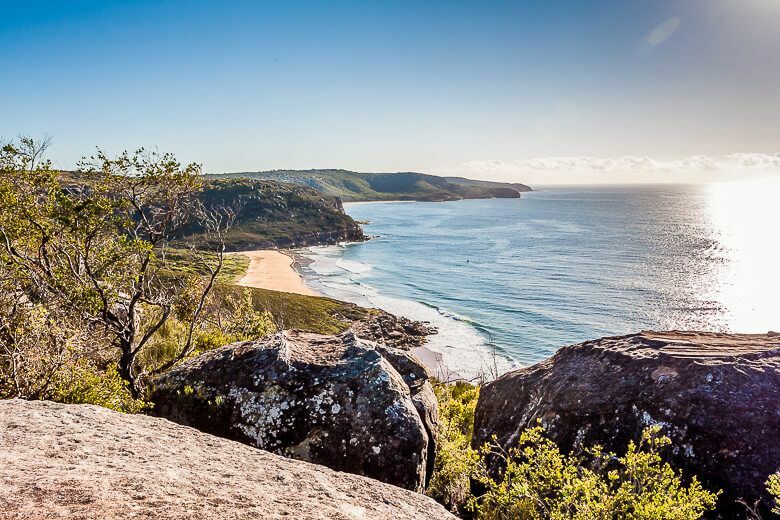 Bouddi National Park... Is it possible that every single walk can end at a secluded beach or on top of a cliff with stunning coastal views? 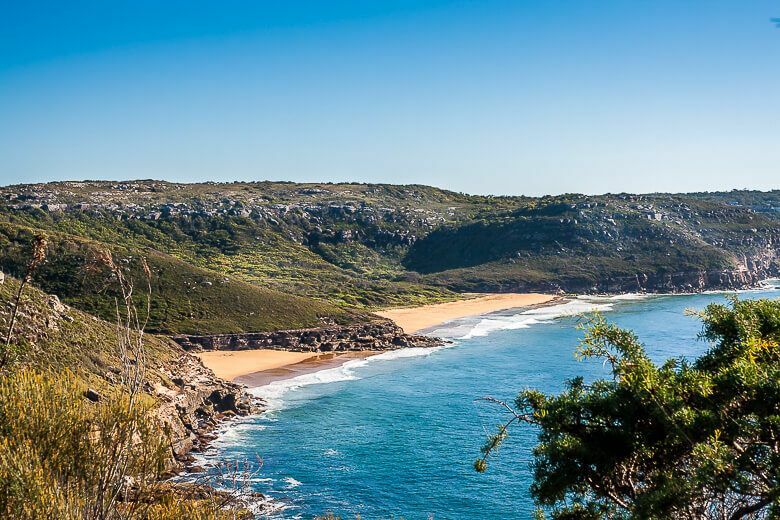 Bouddi National Park has seven beaches – six you can only reach through a bush track. So you guessed it… they don’t attract crowds. You can have a whole beach almost to yourself. And from the bush tracks along the cliffs the view is spectacular. Always! But when we make the effort to walk in Bouddi early in the morning before it gets too hot (it’s easier now that the kids are getting older) I wonder why we don’t do it more often. 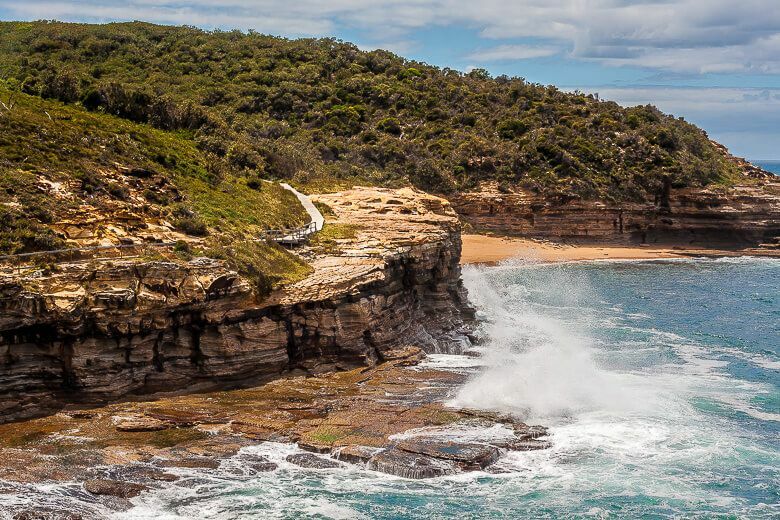 This page lists the best walks in Bouddi National Park ranging between 1.5 and 6 km return. You only need to set aside 2-3 hours, car trip included. Some are great to walk with children. Even toddlers can walk the shortest one. If you fancy a longer walk, link up two or more trails together. See the map at the bottom of the page. 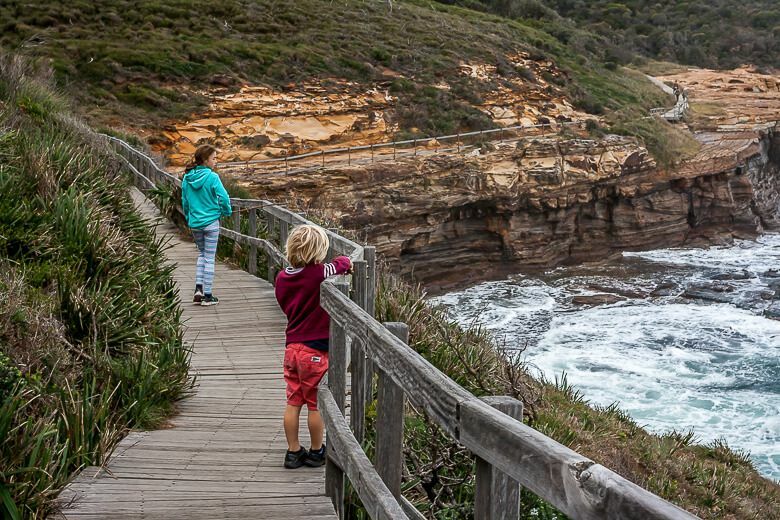 The Coastal Walk is for good reason the most popular walk in Bouddi. 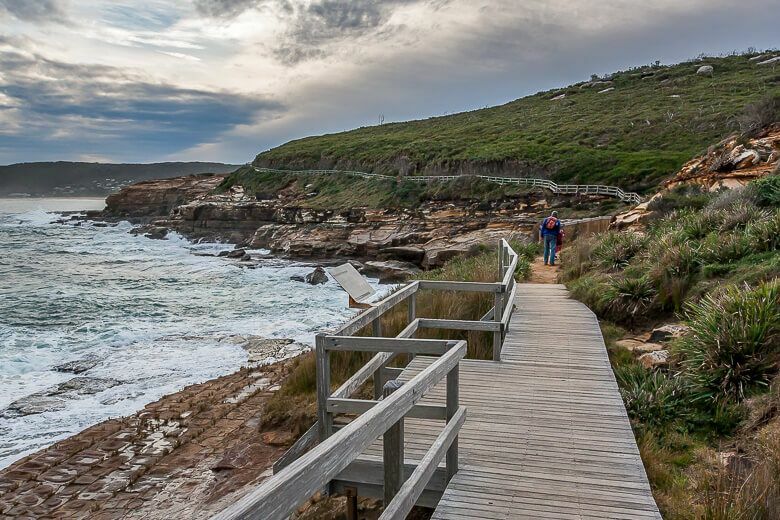 It was nominated as "one of the 18 best day walks in Australia" by the Australian Geographic. The track follows the coastline partly on a boardwalk. The coastal views are amazing. You’ll find many opportunities to take great photos so remember to take your camera. 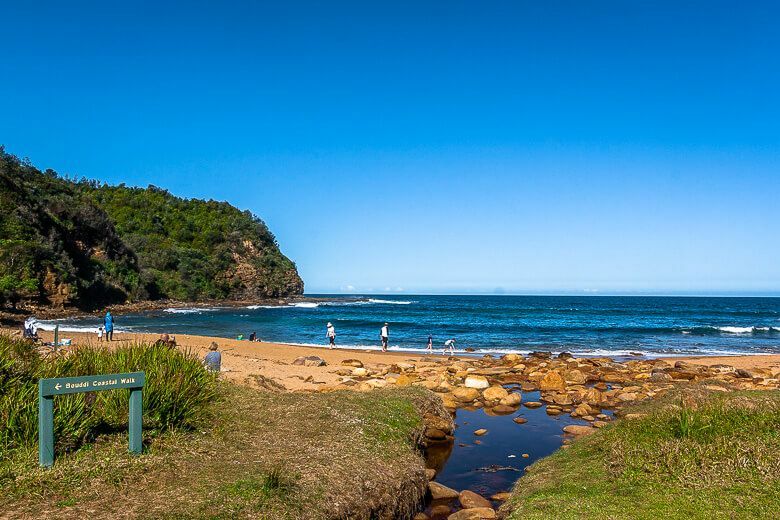 The walk passes Bullimah Beach, then Gerrin Lookout and ends in Maitland Bay. 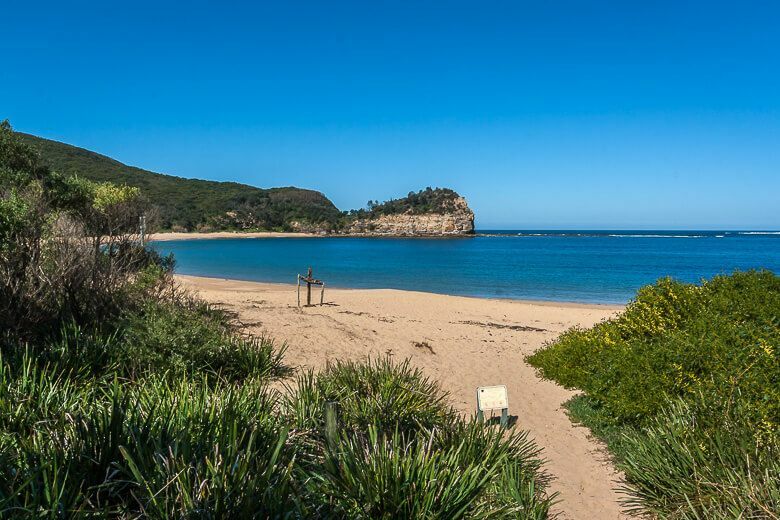 Maitland Bay is a secluded beach. If the tide is low you may see the remains of a shipwreck. The walk is graded as medium but I didn't find anything difficult about it. 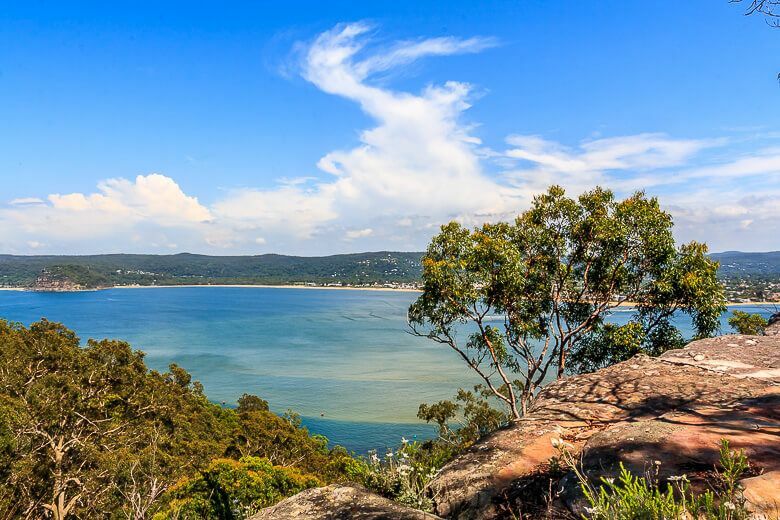 If you want to shorten the walk turn around at Gerrin Point Lookout (2.4 km return). You get views of Maitland Bay from the lookout. 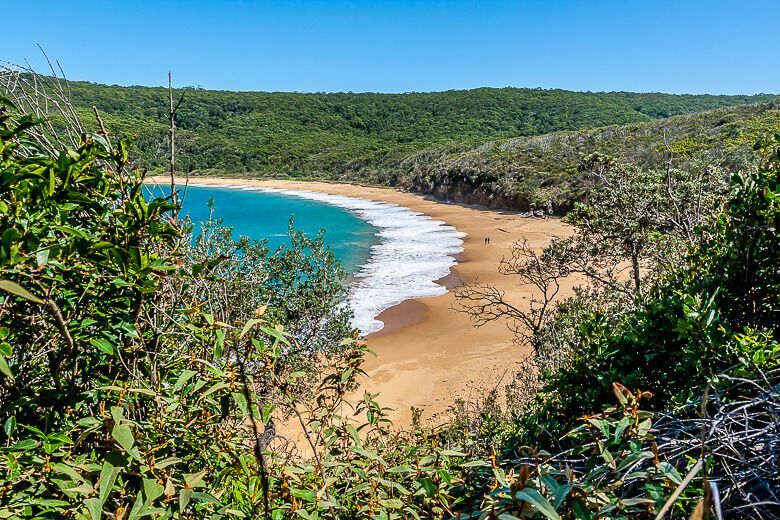 Here I only write about the most accessible and stunning section of the walk from Putty Beach to Maitland Bay. But you can find out more about the whole walk by clicking on the link below. Parking – Putty Beach Rd, Killcare Heights. Drive to the end of the road. Pay $8 parking fee in machine (exact money or credit card). The walk starts at the end of the beach. Or park for free near the middle of the beach. 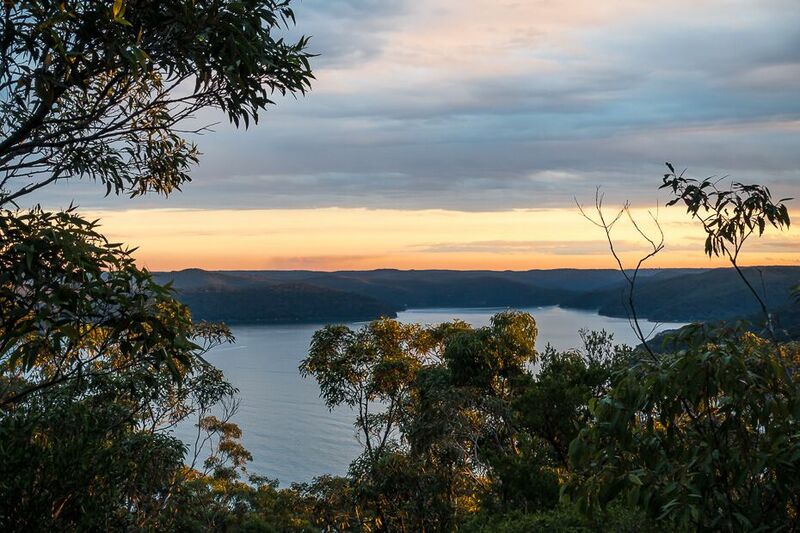 The Maitland Bay Track is a short but steep walk through the Bouddi Grand Deep rainforest. Walking down the well-maintained steps of course means you have to climb them on the way back but it’s worth it. We did this walk with our four-year-old and he managed most of the walk without too much whining. The walk is graded medium. The only difficult part is the return (30 minutes climbing stairs). 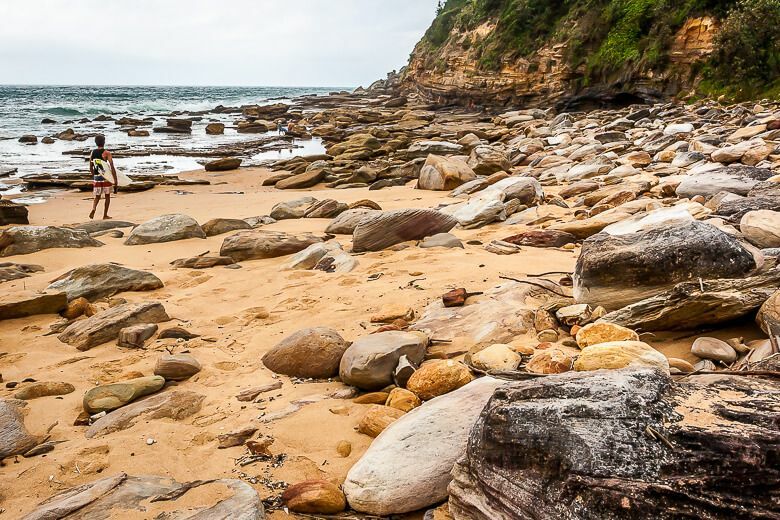 The walk ends again at Maitland Bay – the most popular isolated beach in Bouddi. 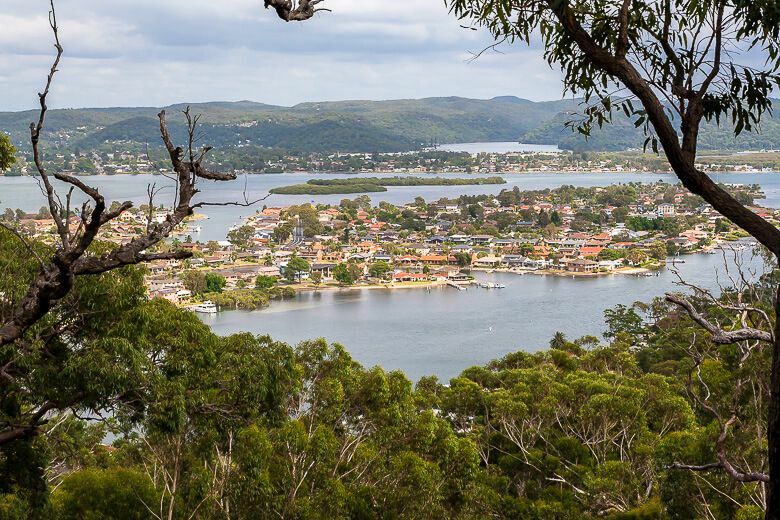 Parking – adjacent to the Maitland Bay Information Centre on Scenic Rd, corner Maitland Bay Dr, Killcare Heights. The walk starts in a dense forest with closed canopy that keeps the hot sun out. A little further are grass trees and burrawangs. Then the bush thins out; the sun rays start to infiltrate the canopy. The track starts to descend steeply. From the top of the steps the coast seems far away, but the descent is not as bad as it appears from the top. As you walk down the sound of the ocean becomes louder and louder. 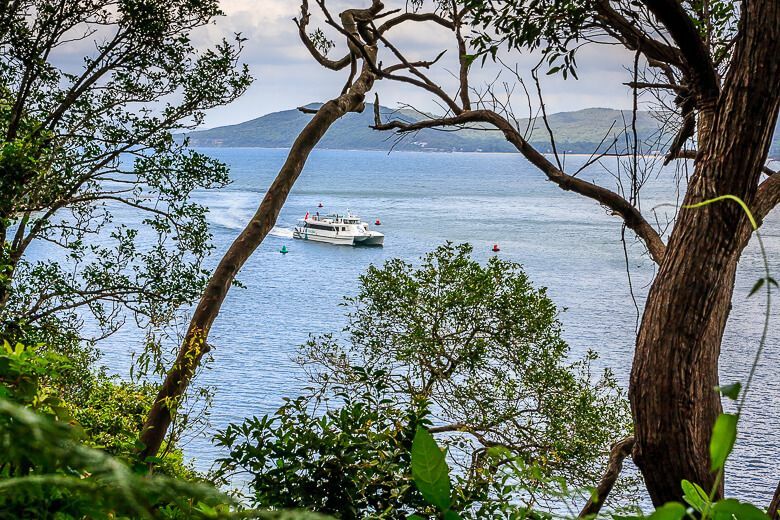 You approach the coast and start getting filtered views of Maitland Bay. Again the walk ends at Maitland Bay. Dip your toe in the ocean and get ready for the little workout. The only difficult part is climbing stairs on the way back (only 10 minutes though). Parking – at the end of Mount Bouddi Rd, Killcare Heights. Okay this one doesn’t end at Maitland Bay. The track follows along the cliffline on Box Head to the tip of the headland. You get elevated views of the ocean to the left and Broken Bay to the right. 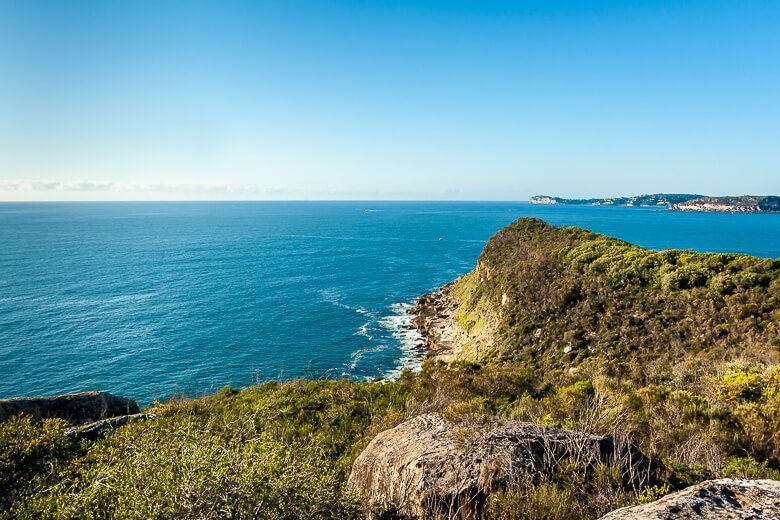 On the tip of the headland you get sweeping views of Palm Beach, the Northern Beaches and the mouth of the Hawkesbury River. The track is officially graded medium but again I can’t see what’s hard about it. Maybe because you walk over boulders and uneven terrain. If you take children keep them close to you – scary cliffs are flanked on the sides of the track toward the end. Parking – at the end of Hawke Head Dr, Killcare. Walk past the fence and down the management trail. Follow the indication to Tallow Beach then take the fork indicated “Box Head”. 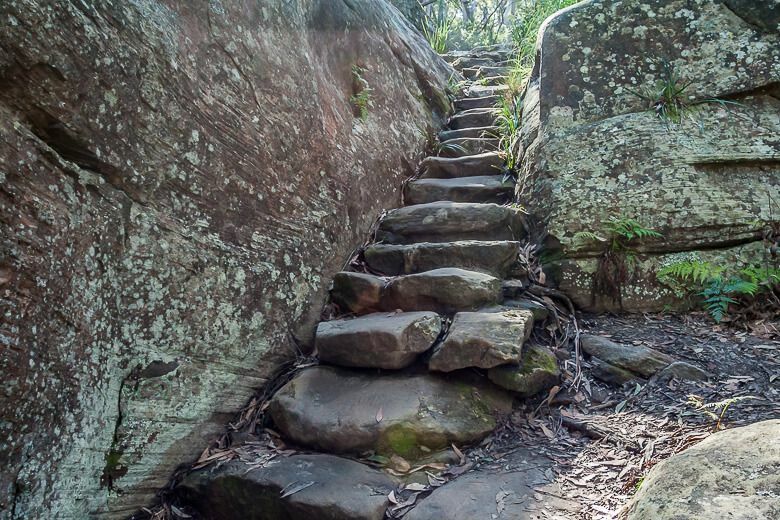 Walk through a delightful forest filled with Angophora trees and cycads (ancient palm-like looking plants that existed before the dinosaurs). You can hear the sound of waves crashing to shore in the distance and you get filtered views of the ocean. At the end of the walk you stand on a large rock where another stunning view of the ocean and putty beach awaits. 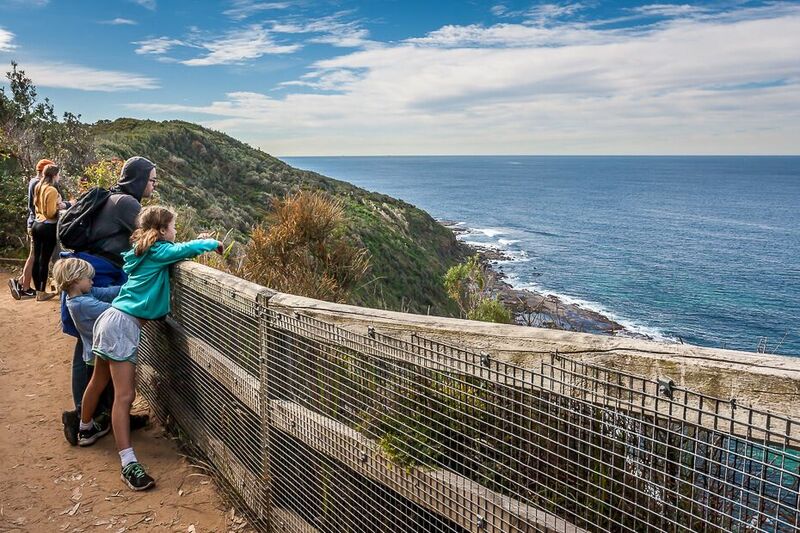 Again, keep your children close to you… there’s no fencing at the lookout (see on the photo below). 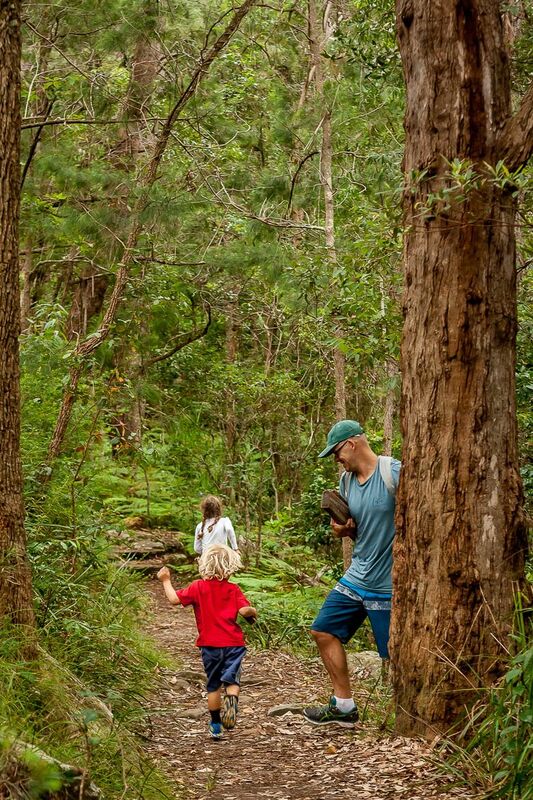 Note: Oliver, a reader, wrote that you can do a scenic circular walk... A well-marked track at the end of Bullimah Spur track links to the Coastal Walk and Maitland Bay. It may be worth walking the loop instead of walking back the same way. Find out more here. Parking – adjacent to the Maitland Bay Information Centre on Scenic Rd, corner Maitland Bay Dr, Killcare Heights. 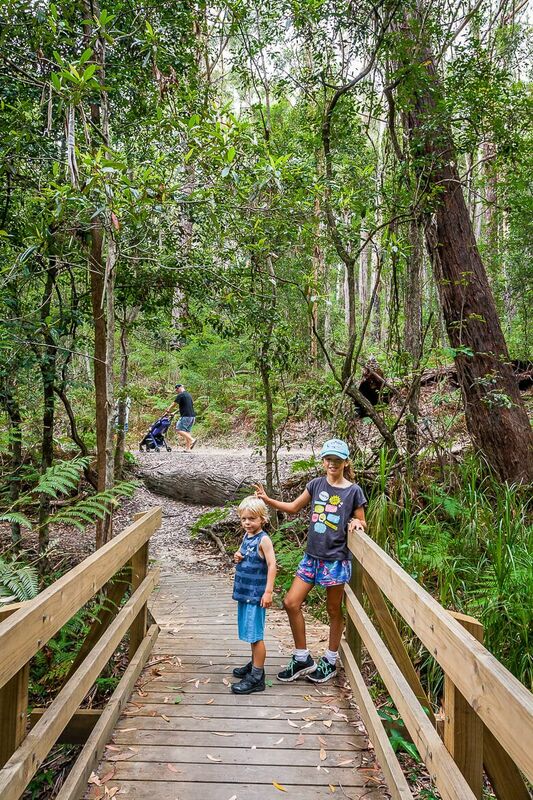 Follow the walk to Maitland Bay a few metres and take the track that branches off indicated “Bullimah Spur Track”. 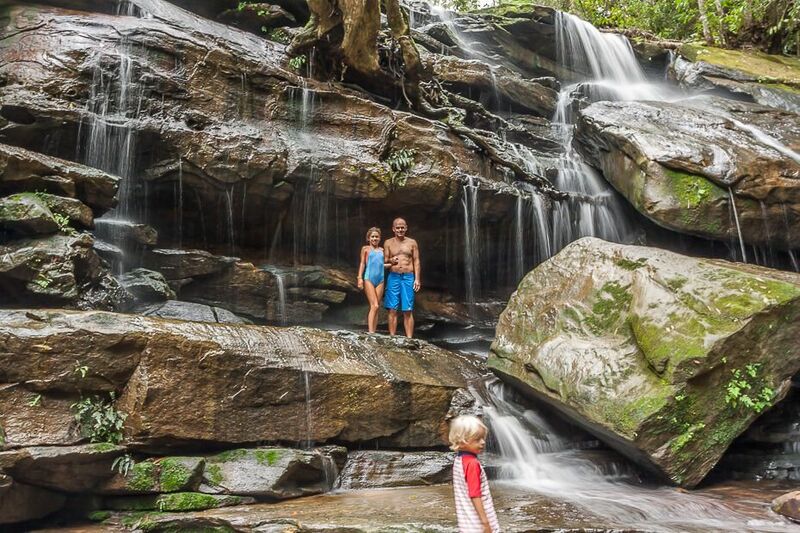 A short easy walk through beautiful remnant rainforest that ends at Little Beach, a secluded beach and camping spot with barbecue facilities and non-flush toilets. It’s so easy toddlers can walk there and back on their own. You can even wheel an all-terrain pram. We’ve walked this one countless times with the babies / kids. Take a picnic and chill out at the beach. 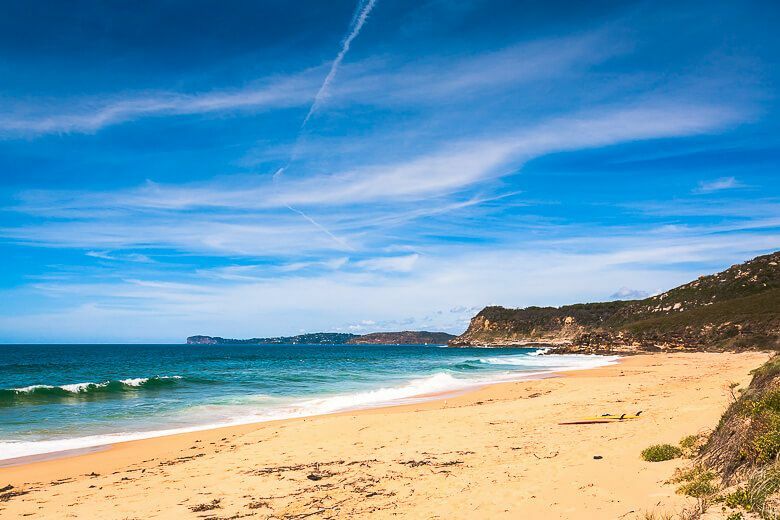 Parking – on Grahame Dr in Macmasters Beach. Drive just past the houses. You’ll see indications for the walk. Flannel flowers, you guessed it, are sprinkled along the trail. Near the start of the walk you get beautiful views of Pearl Beach and Ocean Beach. The walk becomes prettier down the hill in Wagstaffe. Walk pass the “Pedestrian give way to vehicles” fences, then follow the sign to Lobster Beach to the left. 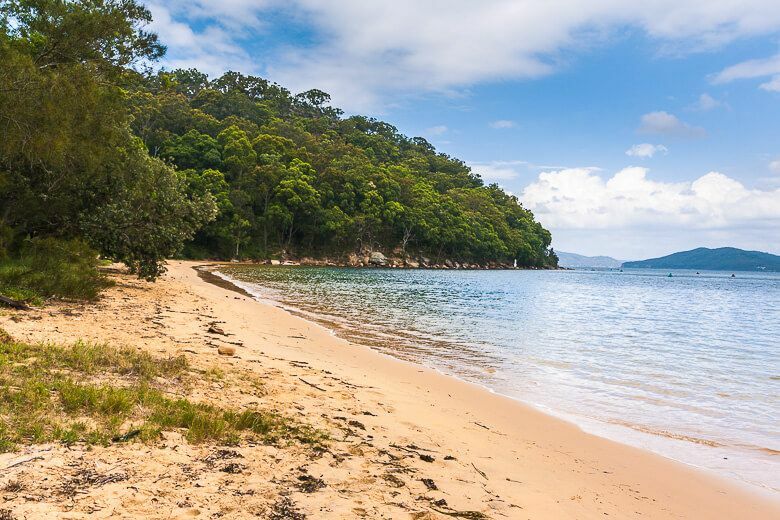 Climb the stairs up then down to Lobster Beach, another isolated beach inside Broken Bay. Lobster Beach is the highlight of the walk. Parking – at the end of Hawke Head Dr, Killcare. Walk past the fence to the end of the management trail. A track indicates “Lobster Beach and Flannel Flower Walking Track”. 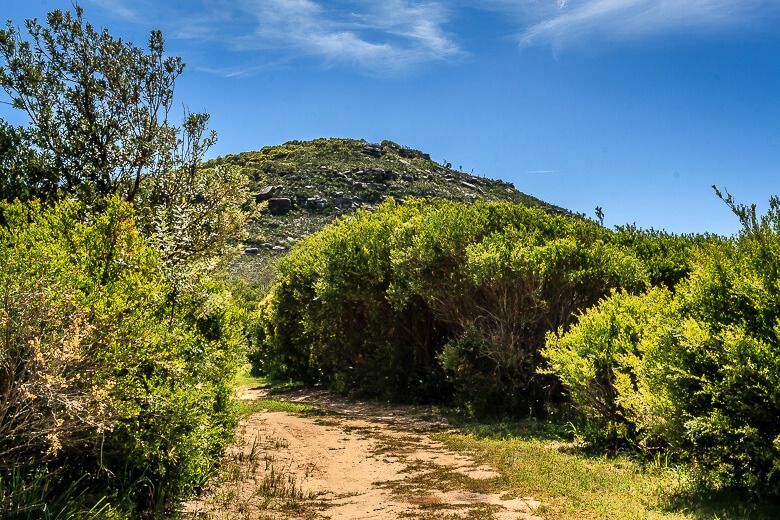 Shortcut to Lobster Beach – If you’d like a quick way to Lobster Beach, forgo the Flannel Flower Walking Track and take the shortcut (less than 1 km return). Starts on High View Rd, corner Venice Rd, Wagstaffe. Climb the stairs up then down to Lobster Beach. You can't wheel a pram because of the stairs. 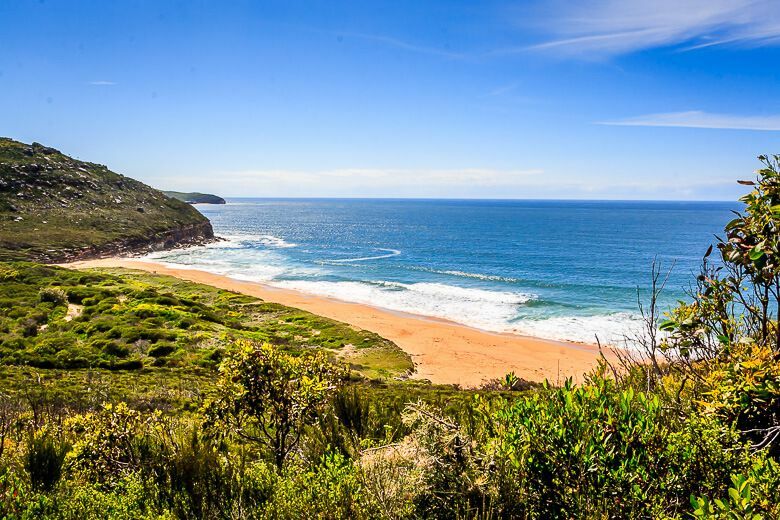 This walk is on a management trail that begins on top of Box Head and ends at Tallow Beach, another isolated beach and camping ground. Some people even cycle the track on mountain bikes. 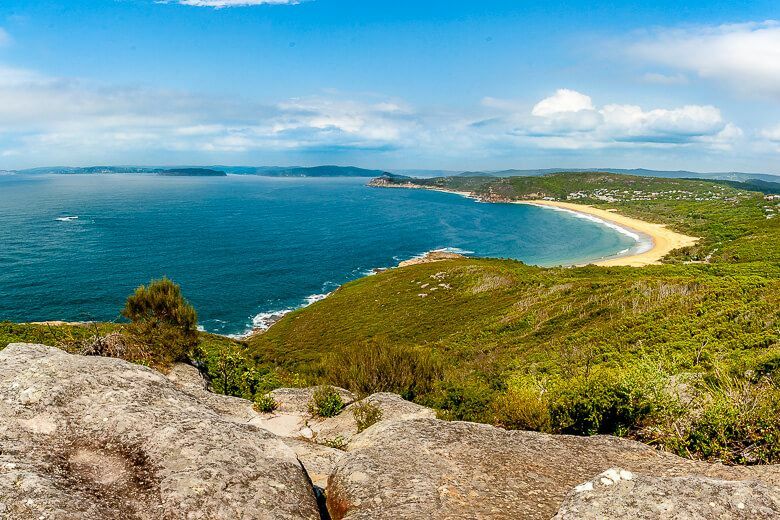 Along the walk you get elevated views of Tallow Beach backed by sandstone escarpments. It’s a short but steep walk. If you like surfing... carry your surfboard down there! Parking – at the end of Hawke Head Dr, Killcare. Walk past the fence to the end of the management trail. Take the left track indicated “Tallow Beach”. 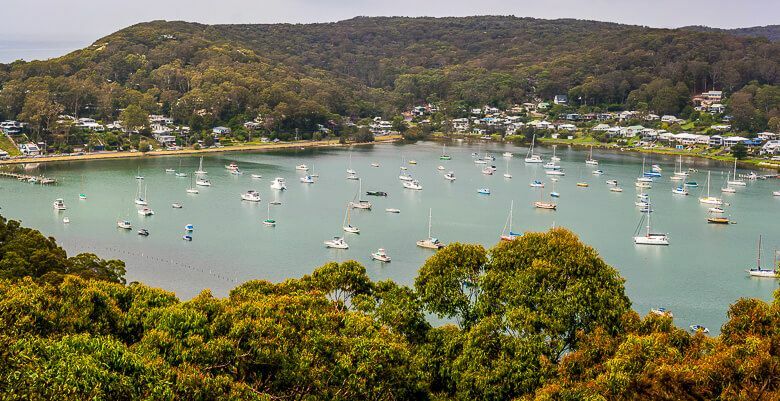 Although I don’t find this management trail through dry woodland alluring, it ends with a beautiful lookout overlooking Hardys Bay dotted with sailing boats. Plus it’s another easy walk for children. My son did it easily. Although we stopped every couple of minutes to eat, take little rests, eat, remove little bits that had made their way inside the shoes, eat… Okay I went off on a tangent. I think this management trail would be more fun on an off-road bicycle. Parking – on Wards Hill Rd, corner Maitland Bay Dr, Killcare Heights. The start of the walk is a couple of metres down the street. This easy management trail through dry woodland is similar to the Allen Strom Lookout trail but longer. I also think this trail would be more fun on an off-road bicycle. During the walk you’ll come across a couple of intersections. Continue straight pass Fishermen’s Trail intersection. At the next Y-intersection take the left to the aboriginal engraving site or the right to the view of St-Hubert’s Island and Brisbane Water. 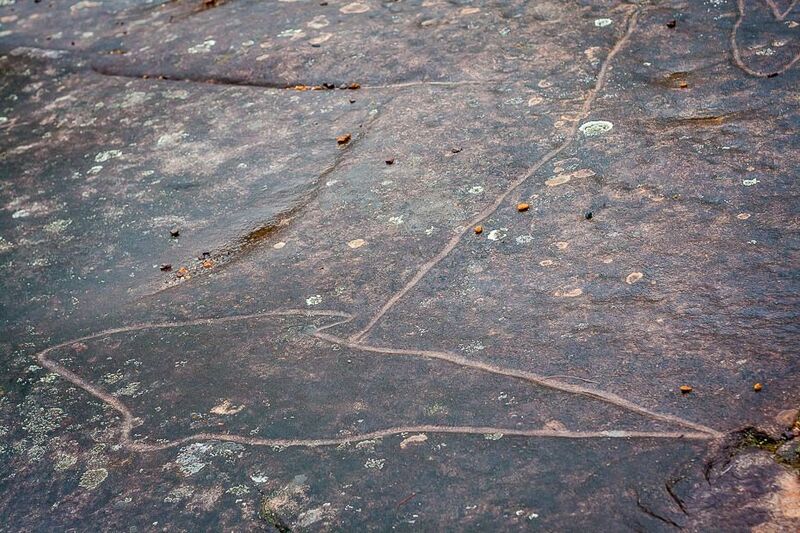 The highlight of the walk is the aboriginal engraving site at the end. 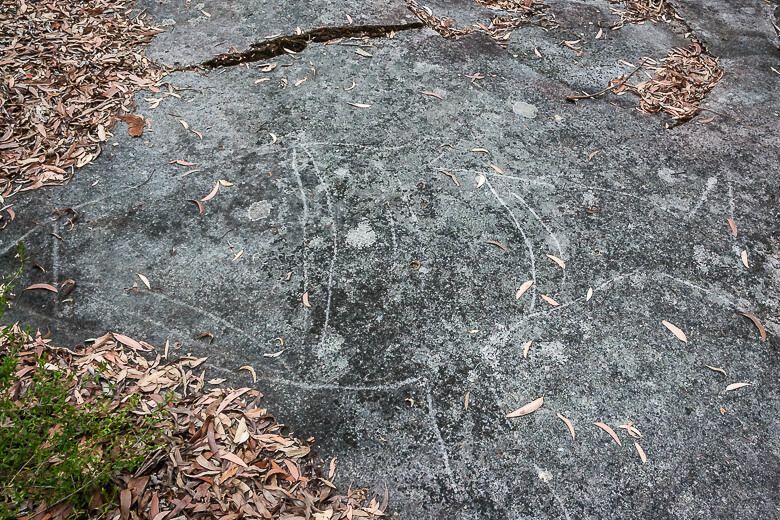 The drawings on the large flat rock are fascinating to look at and are well-worth the walk. Parking – in the carpark on Wards Hill Rd, corner Maitland Bay Dr, Killcare Heights. 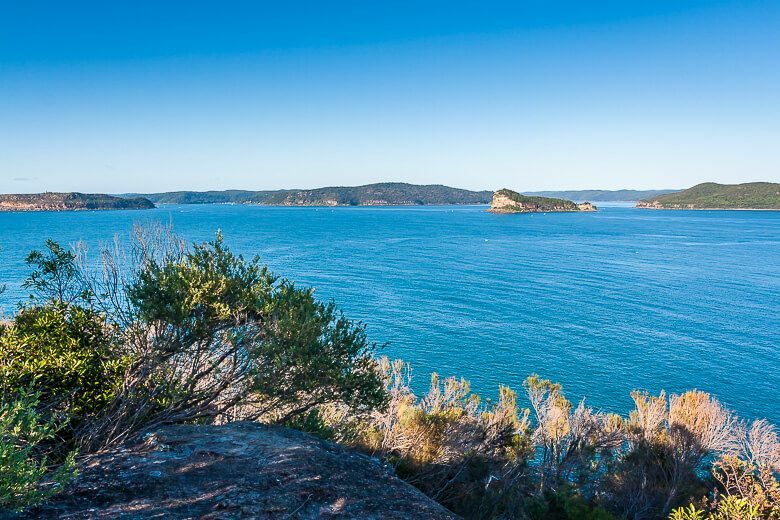 The walks are located in three different sections of Bouddi National Park: on Box Head on the northern side of the mouth of the Hawkesbury River, on the ocean section of the park between Macmasters Beach and Putty Beach, and on the Broken Bay side (west) of Bouddi. All walks are free. You only pay $8 for all-day parking on Putty Beach Road where the Coastal Walk begins. Most walks are accessible by bitumen road except the walks on Box Head. Hawke Head Drive is a dirt road and in bad condition in some parts, but you can still drive on it with a two-wheel drive. Just drive slowly. 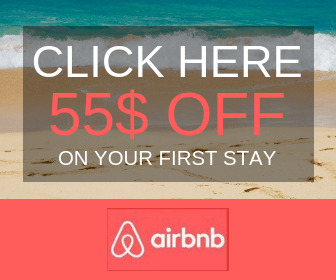 If you want to stay overnight, you can camp at: Putty Beach Campground, Little Beach Campground or Tallow Beach Campground. Putty Beach Campground contains the most facilities and is accessible by car. Little Beach and Tallow Beach campgrounds involve a bit of walking to get there. But the campsites are worth the walk... they feel remote.